The Center for Law and Military Policy conducts research and produces educational material in order to strengthen the legal protections of service members and veterans. Our work helps to close the civil-military gap, the civilian population’s limited understanding of military life and culture. Less than 1% of the country are in the military in any form. The growing divide between the two communities, civilian and military, is harmful and inconsistent with America's founding values. Through rigorous scholarship and timely educational programs, the CLMP seeks to bridge the gap between service member and civilian, deepening understanding, appreciation, and consideration on both sides. The Center for Law and Military Policy is a think tank dedicated to strengthening the legal protections of those who serve our nation in uniform. 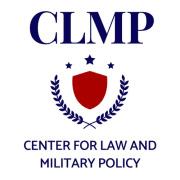 Led by Dwight Stirling, a law professor and reserve JAG officer, the CLMP seeks to change policies that harm everyday service members. The co-founder and former CEO of Veterans Legal Institute, Mr. Stirling has seen first-hand just how vulnerable military personnel are, particularly the rank and file who enlist directly out of high school. Yet while these brave men and women risk their lives keeping America free, their own rights are often ignored or even discarded altogether. This is not right. Serving in uniform should not make a person a second-class citizen. Would you recommend Center For Law and Military?